The Word Works : Blogs : Consuming Japan : The world's biggest outdoor ad? Who got to see it? The world's biggest outdoor ad? Who got to see it? 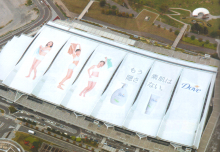 This aerial photo shows what our local news called the world’s largest outdoor ad, which covered the whole of the roof of the Pacifico Yokohama conference center. Previous entry: Why are so many unmarried?